Cannabis users in New York City can breathe a bit easier now. Manhattan District Attorney Cyrus Vance announced on Tuesday that his office will no longer prosecute most charges for the use or possession of marijuana. Beginning Wednesday, prosecutors will not file charges for such offenses committed in New York City. A release from the district attorney’s office outlining the new policy listed two possible exceptions. 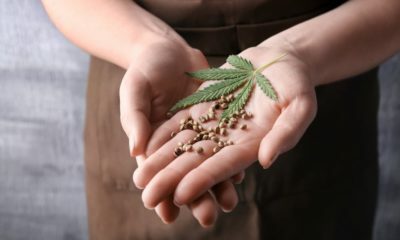 Offenders observed selling cannabis or caught with marijuana packaged for individual sales could be charged with possession if a case for sales could not be established. Additionally, individuals who pose a demonstrated threat to public safety could also face possession or use charges. “Examples include a defendant currently under active investigation for a violent offense or other serious crime,” according to the district attorney’s new guidelines. When low-level marijuana charges are prosecuted, “Assistant District Attorneys must state on the record at arraignment that ‘the case falls within one of the limited exceptions to our marijuana policy,'” according to the release. The district attorney’s office distributed a memo detailing the new “decline to prosecute” policy to Manhattan assistant DAs last week. The NYPD, the Office of Court Administration, and public defenders have also been notified of the changes. Under the new policy, the district attorney’s office expects prosecutions for the possession or use of marijuana to drop 96 percent, from approximately 5,000 cases each year to less than 200. Vance said that he was making the changes in policy in order to make the administration of justice in the city more equitable. “Every day I ask our prosecutors to keep Manhattan safe and make our justice system more equal and fair,” said Vance. Vance also called for the legalization of cannabis in the state of New York. “Tomorrow, our Office will exit a system wherein smoking a joint can ruin your job, your college application, or your immigration status, but our advocacy will continue. I urge New York lawmakers to legalize and regulate marijuana once and for all,” the district attorney continued. Vance’s new policy will also benefit those with past minor marijuana convictions on their record. “In light of the D.A.’s new policy and the decriminalization of marijuana offenses in other states, the D.A.’s Office has been working with public defense organizations and criminal justice stakeholders to proactively seal past marijuana convictions en masse in Fall 2018,” the release from the district attorney’s office states. District Attorney Vance has also enacted other criminal justice reforms to stem the prosecution of low-level offenses. In February, he ended the prosecution of charges for subway fare evasion. In the six months since then, prosecution for the offense has plummeted more than 96 percent and arrests have declined more than 90 percent. With the change in enforcement focus, transit crime is down more than 4.5 percent citywide, according to the NYPD. Despite the efforts to reform the criminal justice in New York City already in place, more work is apparently still needed. A recent report from an NYPD watchdog group found that 93 percent of arrests for marijuana in the city involved defendants who are people of color.